Id Software co-founder and CTO John Carmack has hinted in recent months about a “secret” project that was happening in parallel with his own efforts to bring his company’s “classic” titles to the iPhone. That project was unveiled Wednesday: Doom Resurrection. Due for release in a month or so at a price still to be determined, Doom Resurrection isn’t another retread of a classic Doom game. It’s a completely new effort, a first-person shooter designed exclusively for the iPhone and iPod touch. 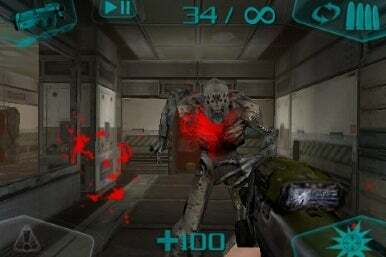 The game uses assets originally developed for Doom 3, Id Software’s 2005 reboot of the legendary first-person shooter franchise. Carmack intimated plans for Doom Resurrection in a blog posting that surfaced when Wolfenstein 3D for iPhone was introduced. The project ran into problems with a previous developer. But striking the right balance at first proved to be a challenge. 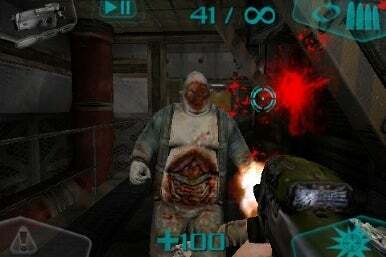 Doom Resurrection was ultimately developed in cooperation with Escalation Studios, whose previous credits include the Ngmoco-published iPhone game Dr. Awesome. Escalation Studio’s Tom Mustaine is no stranger to Id Software games; he’s the co-founder of Ritual Entertainment, and worked on more than a dozen Id engine-derived games. “We sat down about seven or eight months ago and decided we wanted to bring a Doom experience to the iPhone that was unique,” said Mustaine. Mustaine explained that it wasn’t until they settled on a control scheme that combined accelerometer-based movement and aiming with tap-based firing that Doom Resurrection really gelled. “The game features brand new levels created using Doom 3 content,” said Mustaine. That includes artwork and core engine technology that cost $10 million to develop originally, according to Carmack. Doom Resurrection is an entirely new game exclusive to the iPhone that uses Doom 3 assets. Id and Escalation emphasize that this is a new game that will hold new challenges even for experienced Doom veterans. It’s a parallel storyline to the original, essentially: A space marine must protect Earth from invasion from hellish, demonic monsters that have somehow traveled through a dimensional rift on a remote station located on planet Mars. Carmack said the project will run on iPhones and iPod touches running on iPhone OS 2.x; the company plans an update in the future that will exploit some iPhone OS 3.x features, as well. Carmack said that another pet iPhone project of his, Doom Classic, is still firing on all cylinders. He anticipates that for release on the iPhone and iPod touch in the coming month, as well. That game is a recreation of the original Doom game designed to run on the iPhone. Carmack is very enthusiastic about Doom Classic’s forthcoming release on the iPhone. He said he’s learned a lot from Wolfenstein 3D’s release on the platform, and has made some enhancements for Doom, including support for downloadable content. What’s more, Doom will be released as open source code. Combined, this means that game developers and hobbyists will be able to create their own levels and add-ons for Doom Classic for the iPhone. “People will be able to use this as a reference for developing new iPhone games,” said Carmack. He hopes that Doom Classic’s release on the iPhone will lead to a new age of custom level development, specifically for iPhone games, much as there was following Doom’s enormously successful release on the PC over a decade ago. Doom Resurrection offers accelerometer-based aiming and shooting. Carmack said that from a hardware perspective, the iPhone is even more capable than Sony's handheld system, the PlayStation Portable (PSP). He added that Apple has "lots of room for improvement" for game developers, but said that it's "a good phone all by itself as a phone," as well. He's particularly excited about the promise of future hardware, such as the iPhone 3G S's support of OpenGL ES 2.0, a 3D application programming interface (API) that will introduce new features that Id will be able to use to render 3D graphics natively "without smoke and mirrors." “In general, I am super-excited for the iPhone as a platform for Id to be involved in,” said Carmack. He said that he hopes to bring the entire “classic” Id Software game line — Doom, Quake, even Quake 3 — to the iPhone and iPod touch, along with updated versions of Id Software’s mobile titles, Orcs & Elves and Doom RPG. Editor's Note: Id Software indicates "an incorrect trailer video" was originally provided to Macworld and has been replaced with the correct version.